Are you on a hunt for a blow-off or cooling product that is simple and safe (no dangerous gases)? Does it need to be cost-effective as well as powered entirely by compressed air. Vortex Tubes can meet a wide variety of industrial cooling needs. They have no moving parts and require no refrigerants. If you have a compressed air source, you can use our Vortex Tube. They are typically used to cool things like welded parts, gas samples, machining operations, but that’s not their limit. 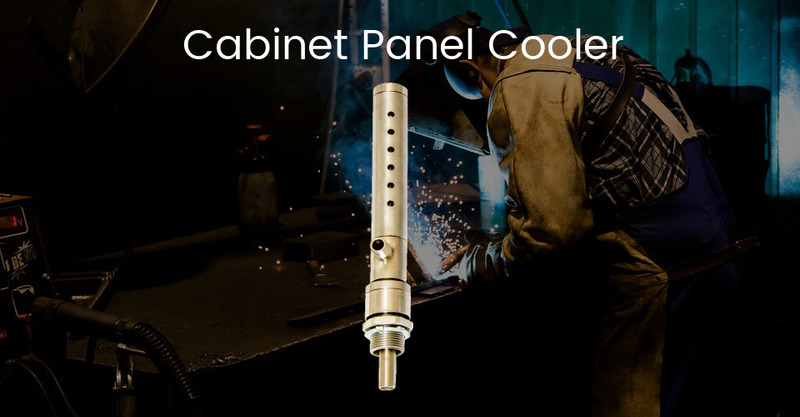 If you have an industrial cooling need, then the Vortex Tube can help. Vortex Tubes will save you money by improving productivity minimizing the effort in the process. The Vortex Tubes are durable and allow you to adjust the temperature. Its construction is simple but effective. The vortex tube was invented in 1933 by French physicist Georges J. Ranque and improved by German Physicist Rudolf Hilsch. It was originally called a Wirbelhrohr, which translates literally to “whirl pipe.” If it were reduced to simple terms, that’s exactly how a Vortex Tube works. Compressed air is injected into the vortex tube, flowing at a rate of up to 1 million RPM towards the “hot” end of the tube. Once the hot air reaches the end, a small amount is exhausted through the control valve. The rest of the air is forced backwards towards the other end, spinning quickly, and exits as ‘cold’ air. We carry three different types of Vortex Tubes: Small, Medium, and Aluminum. The Small and Medium Vortex Tubes are made of Stainless Steel. The Small Vortex Tube consumes 2-8 SCFM of compressed air with a BTU rating of 145-560 BTU/hr while the Medium and Aluminum Vortex Tube require 10-40 SCFM of compressed air with a BTU rating of 700-2800 BTU/hr. There are several accessories available to help you use the Vortex Tube exactly as you need. If you’re not sure about how you can use the Vortex Tube, let us give you a few examples. CNC machining tools can be cooled with a Vortex Tube. Industrial motors in an enclosed space can be cooled with a Vortex Tube. A 3% rejection rate was eliminated using a Vortex Tube. A Heat Set Tubing manufacturer increased production and decreased cooling time by 40%. Even if you may not fall into any of the aforementioned categories, we can still help you find a use for a Vortex Tube in your industrial process. Like every Streamtek Corp product, the Vortex Tube is stringently tested and well-crafted. We also like to make sure our customers understand our products and how they can be used. We offer consultation services to assist you in finding the best use of the product for your facility. If you’re unsure about how an Vortex Tube can be used in your factory, call our Application Engineers at 1-705-770-4455 or email support at support@stream-tek.com.